Sandi's Rec: The extraordinary tale of 10 year old Judith and her father (told in her voice), Judith is certain she is an instrument of God after it snows on the day she was to be confronted by the school's bully. A moving story of a child trying to reconcile her beliefs with an often-harsh real world. Judith and her father don't have much—their house is full of dusty relics, reminders of the mother she's never known. But Judith sees the world with the clear Eyes of Faith, and where others might see rubbish, Judith sees possibility. Bullied at school, she finds solace in making a model of the Promised Land—little people made from pipe cleaners, a sliver of moon, luminous stars, and a mirror sea—a world of wonder that Judith calls the Land of Decoration. Perhaps, she thinks, if she makes it snow indoors (using shaving cream and cotton balls and Scotch tape) there will be no school on Monday. Sure enough, when Judith opens her curtains the next day, the world beyond her window has turned white. She has performed her first miracle. And that's when her troubles begin. 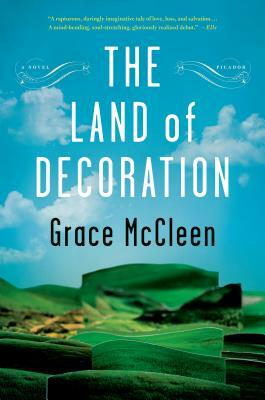 With its intensely taut storytelling and gorgeous prose, The Land of Decoration is a breathtaking story of good and evil, belief and doubt. Grace McCleen is a blazing new talent in contemporary literature. Grace McCleen studied English Literature at Oxford University and The University of York before becoming a full-time writer and musician. She lives in London. The Land of Decoration is her first novel. “Gripping, beautiful… [M]akes you gasp with delight…In many ways it's suspense--is Judith going to get hurt?--that keeps you tearing through the pages (be prepared for the complete and total devastation of your social life; once you pick up this novel, you will not be able to do anything until you finish)... This isn't a child like the other children in books--say, the unbelievably smart ones who can lecture on astronomy and rare stamps. This is a regular old child, a loving, confused, tender-hearted little person who is trying, like all of us, to make some sense of out of this life.” —Oprah.com pick for "Book of the Week"